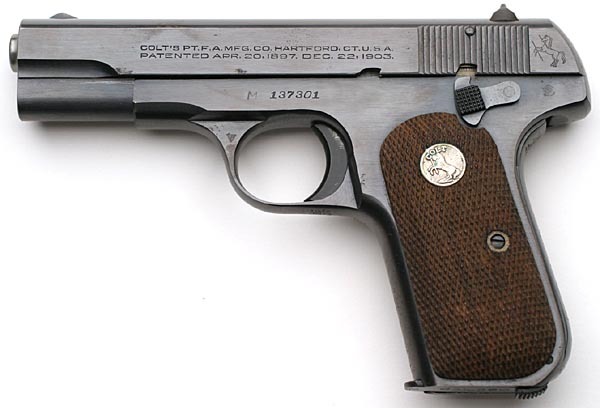 Colt Model 1908 Pocket Hammerless .380 ACP Serial Number 137301 Type V (left side) (ca. 1944) - integrated barrel bushing, 3 3/4" barrel, magazine safety, military sights (1911A1), 19 serrations (1911A1) and parkerized finish (.32 only) (.32 sn range 562001 - 572215), blued finish (.380 only) (.380 sn range 136001 - 138010) This example is a late Type V .380 variation with U.S. Property marking in the right side of frame. 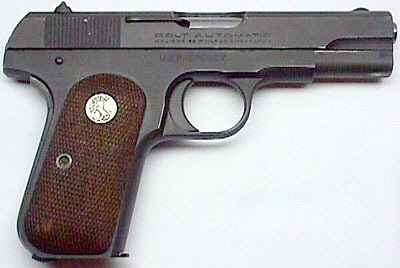 This Model M .380 pistol was issued to Brigadier General Joseph Burton Sweet. 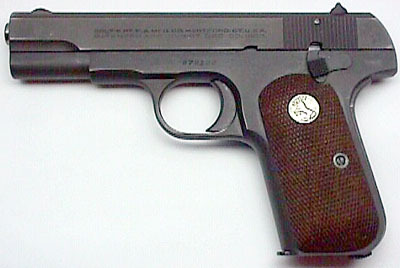 Colt Model 1903 Pocket Hammerless .32 ACP Serial Number 572122 Type V (left side) (ca. 1945) - integrated barrel bushing, 3 3/4" barrel, and magazine safety. This example is a pre/post-war military contract overrun Type V .32 variation (shipped in 1946) with parkerized finish and machine checkered walnut grips with flush Colt grip medallions in as-new condition. 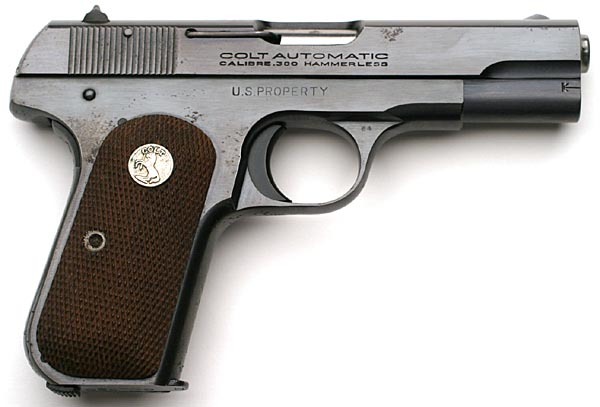 Colt Model 1903 Pocket Hammerless .32 ACP Serial Number 572122 Type V (right side) - Serial Number 572122 was shipped to Joseph Lorch, Colt's Washington, D.C. agent in 1946. This pistol came with the original bill of sale from Norm Strebe in 1947.